Hi all – I’m Liz, the Chief Mom Officer, and I’m so happy my friend Physician on FIRE has invited me over to the site today to talk all about one of my favorite topics – overcoming challenges on the way to Financial Independence (FI). In fact I like to say I’ve been pursuing it for 20 years now. I’ve been an avid fan of all things personal finance and investing since I was a teenager, reading The Wealthy Barber at my local library at sixteen. That may have given me some significant advantages in being financially smart, but life has thrown a number of obstacles in my way. Despite them, I’ve never given up on the financial freedom journey – and I never will. When life knocks you down, you just need to get right back up again and keep on going. Today I’m an MBA, breadwinner (sole income earner) and mother of three, earning a high income in Information Technology at a very large company. I’m going to have my mortgage paid off by 40 (just like PoF), and I’ll reach financial independence sometime in my early 40’s, while fully funding three kids’ college. I also run a moderately successful website, Chief Mom Officer. Looking at this information, perhaps you would think I’m pretty darned successful. But it hasn’t been easy. Let’s say there’s a young woman – very bright but got in some trouble in high school. She didn’t do overly well there, and when it comes time for college, she’s going to have to pay her own way. So she gets a full-time job with tuition reimbursement, working 40 hours per week at a large company’s call center earning $22k per year while going full time to community college evenings and weekends. When finished with two years there, she switches over to the inexpensive in-state public college. Since she’s still working full time while going to school full time, there are no fancy internships or fun summers abroad like her classmates. She’s married at 21, and in her last semester of college they find out that they’re expecting a baby. So two months after graduation, they welcome their oldest son into the world. Since they can’t afford daycare, this couple goes through quite a few different working arrangements. At first, he works third shift at his factory while she works a normal work day at the bottom rungs of IT at that same large company. But that results in him getting almost no sleep. So he leaves the factory for a few years and works part-time renovating old apartments into condos. It’s approaching the top of the housing market (although no one knows it), so there’s a lot of demand for this work. That eventually ends, and he goes back to full-time work – but second shift now, which helps with sleep. She’s also working her way up the IT career ladder at her corporation, doing pretty well now. They sell the condo she purchased at 20 instead of renting an apartment, and use the proceeds to buy a house. They have another son a few years later. Shortly after she starts her MBA to fulfill a long-held dream of getting a “better education” than she did originally, and to seek an even better future. During statistics class, she gets a text message from her husband that his factory is closing. It’s 2009, the Great Recession, and jobs aren’t exactly easy to come by. So he stays at home with the boys while she continues to work and get that MBA. You see, the husband, 37 at the time, has had several diverticulitis attacks over the past few years. The doctors recommend a surgery called a laparoscopic partial sigmoid colectomy, which removes the part of the intestine causing issues. The surgeon describes the operation as a relatively simple one, with a few days recovery in the hospital, and a 99% chance of going just fine. First, it can’t be done laparoscopically, because apparently there’s internal damage due to a prior intestinal rupture. The surgeon refers to it as the “worst non-emergency surgery” she’s ever seen. After a few days in the hospital, he’s not getting better. In fact, he’s getting worse. Eventually the hospital does a CT scan and discovers that one of the staples holding the intestine together – isn’t. For those not in the medical field, that’s a really, really bad thing. He goes in immediately for emergency surgery, and afterward, is rushed to the ICU. His blood pressure and oxygen levels crashed. He’s in septic shock, a deadly runaway reaction to infection, which often results in multiple organ dysfunction syndrome (organ failure) and death. Now this 32-year old woman is not only working full time and pursuing an MBA, but also needs to arrange for childcare for their two kids and provide care for her husband. He’ll remain in the ICU, in a coma and on a ventilator, for a week. After waking up, there are months — and years — of more medical issues. He spends a month away from home in the hospital and short-term rehabilitation. After he’s home, there’s at-home nursing care, extensive physical therapy and another surgery – an ileostomy reversal six months later. Since this all happened, he hasn’t been able to work full time. After a short stint in a part-time job, he discovers his abdominal wall has totally disintegrated – shortly after they learn they’re expecting their third child. This led to the need for a seven-hour long total abdominal wall reconstruction, and other few months recovery when that child is six months old. Let me ask – what kind of financial future would think this couple has? Maybe they were foreclosed on when he lost his job in the Great Recession. Or they’re buried under massive medical and other debt. He can’t work, she needs to support the family herself, they have three kids – perhaps they’re collecting disability and living paycheck to paycheck. I’m sure you’ve guessed by now that this is my story. It was after reading The Wealthy Barber as a teenager that I realized you didn’t need a tremendous income to become wealthy. You needed discipline, wisdom, determination, and time. So I started saving and investing for retirement with my teenage job at a local restaurant and amusement park, then in that $22k per year job. I understood that small amounts saved, starting at an early age, would have huge compounding power years down the line. So I always saved and invested 10-20% of my income, even when it was low. When my son was born, despite just finishing college myself, I started a college fund for him with the dream that one day he would not have to go through what I did. Remember in the story I mentioned the sale of that condo? Well, I knew from my financial reading that owning was usually better than renting if you were going to stay in the same location for a while. I made $65k on the sale of that condo, rather than paying rent for six years. It enabled us to move into a house that would fit our family comfortably no matter how many kids we had. When my husband lost his job, we still saved and invested. After he became ill, we were able to take the hit to income and huge expenses simply by ratcheting down retirement to the level of the match (6%) and stopping other saving/investing for a year. It was after that horrible medical event that I became determined to become financially independent as soon as possible, rather than in our 50’s or 60’s as I had originally thought. I got rid of the small amount of “normal” debt we had accumulated over the years and turbocharged our savings and investments. Over the years my income has increased from that $22k per year in my first full time job to nearly ten times as much today. After having lived at a lower income level for a long time, we have no desire to ratchet up lifestyle. My husband doesn’t collect social security disability or anything like that, we simply live on part of my income. Even though we have three kids we drive cars, not SUV’s, and both are owned free and clear (mine has 114k miles on it). We still live in the same house we bought all those years ago, even though our family now consists of two adults, a teenager, a ten-year old and a toddler. The house will be mortgage free before I’m 40, and we’ll likely reach financial independence shortly thereafter. I’m not alone in the financial community in overcoming obstacles on the path to a brighter financial future. Not that long ago, I published the story of my friend Dave the FI Journeyman, who had a similar start to mine in community college. And there’s the Gen Y Finance Guy, who left a comment on one of my posts after reading Dave’s story. He’s gone from a welfare upbringing with drug addict parents, to the C-suite. Even though my own journey has been a difficult one, I don’t waste my time and energy complaining about it, or being envious of others. Whenever I see financially independent folks featured in the traditional media, there’s a chorus of comments about how they “had it easy”. Of course it’s easier to achieve financial freedom if you don’t have kids, have one kid instead of three, went to a prestigious school, always had a high paying job, or whatever other advantage you can think of. Some of us are dealt worse hands than others. Wasting time and energy complaining about the hand we’ve been dealt, rather than simply playing it, keeps us from financial freedom and success. When you’re pursuing financial freedom, the most important parts are to (1) start where you are, wherever that is and (2) to not give up. If you always live below your means and save and invest, even at a low income, you will be successful. Even if you’re derailed from the journey for a while, being on this kind of financial path brings tremendous rewards and opportunities. Especially when things go wrong. Thanks again to my friend PoF for having me on the site to share my story. Readers, what obstacles have you overcome in pursuit of financial independence? Thanks for sharing your story CMO and wow, you an your husband have persevered through some tough times. But resilience and toughness beat bad times, and you’re showing how financial responsibility can serve as the bedrock to weathering any storm. Kudos and keep swimming! Thanks AF-I hope my story helps someone else who might be going through tough times themselves. You can persevere, even if you suffer a major setback. What an inspiring story. You have certainly had a lot of obstacles in your path and your ability to overcome them and still be on track to FIRE in your 40s is truly remarkable. I think these obstacles have had side effects that are beneficial though it didn’t seem like it at the time. I just wrapped up a 5 post series of me making every financial mistake in the book and even though it ended up being a 7 figure hit to my net worth I doubt I would be at the position I am today if I hadn’t gone through it. Totally agree-going through something like this has a silver lining for sure. Although I’d still rather not have gone through it in the first place. Wow, CMO. You and your family are incredible. The difficult times shape us just as much (or more) than the easy times. You have really gone through the gauntlet. And ended up better on the other side. Not many can say that. I bet many would have thrown in the towel. Thank you for sharing your story and for being an inspiration! It’s not always easy, but it has always seemed “worth it” in your story. I prefer continuing to keep on swimming to the alternative. Wow such an inspiring story, you guys are so strong with the journey you have been through as a family. Thanks for sharing this, it reminds me to always be grateful no matter the situation. Yep, there are many folks out there who have succeeded despite much worse obstacles. Reading those kinds of stories has always been inspiring to me, and I hope I can help inspire someone else. I love hearing your story! It’s always inspirational so keep on inspiring….I red rixh dad poor Dad when I was in high school but unfortunately it didn’t change my habits. I think it was the promise of a high doctor salary that kept me spending. Not until I was an attending did I wake up to the need of financial independence. Thanks DDD-you have quite the story yourself now. Funny how the same events (reading a financial book When young) can have different impacts on different people. CMO, I’ve read your blog, and had some of the story, but not the details. You have proven what I’ve seen many times….that your attitude, and response, is far more important than your circumstance. Yes that was, quite easily, the worst time in my life. I was beyond exhausted-mentally and physically-and had to face the very real prospect I may have to tell my kids their father had died. Luckily I didn’t need to do that, and he is healthier nowadays. You, my friend, are a total rockstar! I love your story and I’m a big believer in no excuses. We are all born with the freedom to make choices regardless of our circumstances. You made excellent decisions along the way and it helped you fight through the tough times. Very well done! It really is. I hear it criticized as “unrealistic” or not a good idea, which is one reason why I want to share stories from people who have gone that path – and succeeded. What an inspiring story! Thanks for sharing! My family and I immigrated to this country when I was 11 years old, I’m 40 now. My parents worked multiple jobs to try and make ends meet while raising 4 girls in a foreign country without any family support. They had no financial education and never saved for retirement. I saw how much they struggled and I believe that helped me realize that I wanted something different for myself. I didn’t know anything about how to start a retirement account or investing when I was young since I had no guidance from my parents so my journey to financial independence definitely had a late start, but I’ve always been frugal and avoided getting into debt early on until I went to medical school and inevitably acquired a whole bunch of it in student loans. My sisters unfortunately didn’t learn from our parents’ experience and made lots of bad decisions throughout their lives which have led to financial struggles. I wish they could read this post and hopefully learn that although difficult, it is possible to be successful with the right mindset and plan. Sounds like your parents did a wonderful job, and worked very hard to provide all their kids with opportunities! I hope your sisters learn the lesson before it’s too late. Community college is a very practical route for the determined student. A high school classmate of mine had few prospects. A teacher took him to sign up for community college. He ended up rising high in a major 3 letter IT company. The stats are higher completion rates for 4 year schools. Thank you Mom MD-it hasn’t been easy. But we’ve made it through. I wanted to use a second comment so that my response does not dilute my profound respect for Chief Mom Officer. I have struggled financially until my 40s due to loss of a small medical practice and bankruptcy to release from the lease, my spouse’s mental illness and ultimate untimely death left me with 2 children and a tattered life. That was when I discovered FI and the concepts of baby steps to freedom and FI. It has helped not just financially but also with a life roadmap. Familial mental illness has made life hard for both my kids as well. We now have a retirement fund in low 6 figures and full funding for both children for 4 years of college. The children are stable and stronger now than I could have ever imagined. I’m far older than you two. My FI will be at a more typical age. Without blogs like these and a strong community and faith it would not have been possible. Each blog, each book and each course builds more for the next family to follow. Thank you all so much. What an amazing story. I can’t imagine the emotional strength and discipline it must have taken to fight through all of that and keep pushing forward. I haven’t had to overcome anywhere near that kind of adversity, and I certainly won’t be financially independent by my early 40s. As painful as I know walking that road must have been, to have overcome so much must leave you feeling confident you can handle anything. Your children are probably still to young to fully understand what you have accomplished, but as they get older I know they will become increasingly aware of what you managed to do, and be very grateful for the example you have set. Congratulations on your ability to be dealt a tough hand and still manage to win with it. You’re right Ray – they were so young at the time they didn’t know how bad things were, or how hard I worked to keep the family on the right path. I hope when they grow up, they’ll see and appreciate the things I did in a different light. I know that now that I’m an adult, I certainly see the things my parents did for me as a child in a different light than I used to. You my friend are Chief Hustle Officer. Your ability to build wealth while handling whatever life throws your way is inspiring. I prefer it to the alternative of doing nothing and feeling sorry for myself. Thanks for sharing. That’s a pretty scary story. Good thing you read The Wealthy Barber when you were young. It gave you a huge headstart in life. I think many people seeking FI had challenging pasts. If life was easy, then there is no drive to push for FI. That’s just my opinion. Good point Joe-I bet that’s a driving factor for many. Liz – I always appreciate your story and your courage to tell it, it’s a good reminds me that things do usually get better. I know we feel like there’s a new lease on life and we’re going to take full advantage of it! I’d love to read it, if you did. Stories of overcoming obstacles are inspiring-not just to me, but to many others as well. A story of remarkable grit, and the power of executing the right plan. What was your investment strategy 20 years ago and has it changed since? I’ve almost always been invested in index funds-been a Vanguard client for most of the 20 years. But I say “almost” because my very first investment was one my father helped me find-a Janus 20 fund. It was invested heavily in tech stocks in the late 90’s, so you can guess how that ended in 2000/2001. It really set me off on the path to indexing. Thanks for sharing your story. I’m sorry you had to go through all of that. Over my years as a general surgeon, I had so many patients who came in with very severe problems, and after getting them through it, and months of rehab, I never saw the effects on the family. I only saw how the patient healed. Occasionally someone would bring in their bill and show me what it took to get through that terrible health scare. Many people go through an ordeal like yours and give up and think they can never get ahead now. But most people who do get ahead had some setbacks along the way of some sort. Very few had a smooth journey to financial success. They rolled with the punches and played the hand they were dealt and won the game despite the obstacles. I remember a Texas Hold-em poker hand I played in where someone bet on a 2-7 off suit. It is the worst starting hand in the game. I, on the other hand had a great starting hand. 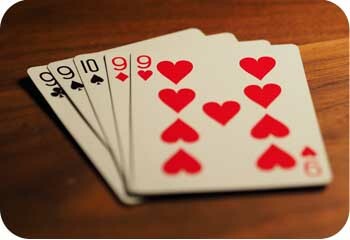 The flop came out as 7-7-2 and the worst starting hand in the game became the winner. You never know what tomorrow may bring, so keep on doing the right thing and eventually you will achieve your goal. Even a turtle will reach the finish line if she keeps on walking in the right direction. That’s so true! And I’ve heard the same remark from other docs, they find it interesting to read about a medical crisis from a perspective like mine. Doctors mostly talk with the patients, and only for short periods of time focused on their health issue (of course). They don’t see all the time at home, or hear about all the non-medical things from a family members perspective. Indeed, a remarkable story – one with many lessons to be learned. Having teenagers, I will definitely share the importance of getting good grades in high school for scholarships, as trouble in high school apparently led to some bad long-term outcomes . Although working during school and saving money early is good, I wonder if less work in high school and college would have led to less stress. I know college students that have to work many hours, and their grades generally suffer. Working full time and going to school full time is tough, as is having a child and no daycare. I do think we can get overly focused on FIRE and not focus on decreasing life stress by making good decisions. It is sad that adverse health outcomes had such a large effect, and that is something that can happen to us all. Actually I graduated with high honors, going to school full time and working full time. So I wouldn’t say my grades really suffered. Graduating with high honors is one of the reasons why I was able to springboard into a lucrative career upon graduating. When your parents won’t fill out the FAFSA, you don’t have a whole lot of options. I’m so happy to hear that these obstacles didn’t “sink the boat”, if you will. Positivism is something I see all over this community! I often worry about medical expenses after reaching FI, especially because my wife and I were in a serious car accident and I wonder if maybe she will have some problems later on in life because of it. But your story is a real example of perseverance! Thanks for being so open in sharing your story. I love how persistent and tenacious you were in moving forward and pushing for improvement. I grew up pretty close to poverty, and my mom was physically abused, so I grew up determined to be financially independent (and not having to rely on my husband). I put myself through college (Chem Engr, after I discovered that med school would take me another extra 3-4 years before I could earn a decent paycheck) while working 2-3 jobs. One thing that hasn’t changed for me, is how I always look at my purchase and question its value (do I need it? Can I get it for less?). No matter how much $$$ we make today, and that we’re close to our FI in our 40s, I am always that little girl watching my grandma scrambling for changes to put meals on the table.